In October 2013, when he was in 4th grade, The Kid went chukar hunting with me, and it was his first time looking for galliformes to shoot in the hills his family’s run cattle on for generations. We hunted a bunch of times that season, but I never managed to get him in position to get a good shot at a chukar. He never lost hope, though. He always wanted to go again. The next season, 2014-15, was a bad bird year, and we got out together a few times, once doing an epic climb in hot weather off of Brownlee. But still no chukar. 2015-16 was a weird year for birds, and for us with Peat. The Kid joined us a few times, doing another couple brutal climbs. He did get close toward the end of the season, managing to catch up to a solid point by Peat and missing on the rise, probably because of the shock of seeing 20 birds take off and not being able to pick out just one. So we went out on Saturday. I had mixed hopes; we were headed to a place I’ve been seeing loads of birds, but they move around a lot in a big area so sometimes it’s a bunch of hiking and not much action. And even if we did run into lots of birds, in the past it’s been hard to get him into position for a good shot. The curse, for real, was over. 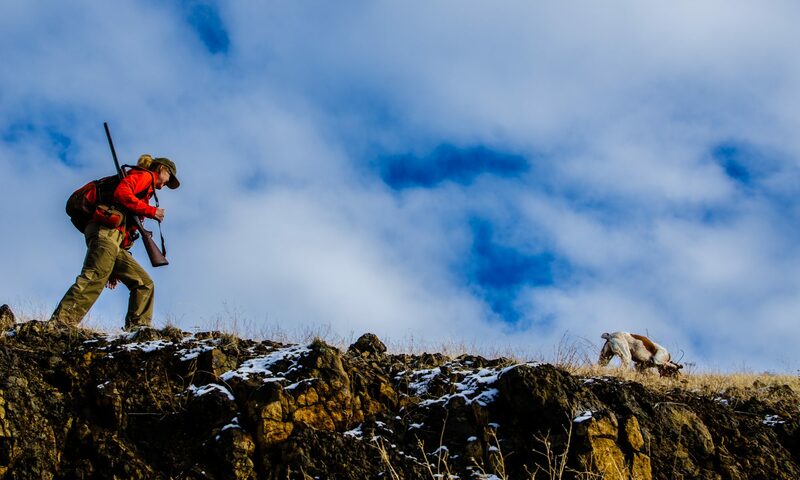 Before the end of the day, The Kid had three chukar, and got to experience numerous points, long relocation creeps, some incredible retrieves, and the complete experience of chukar hunting, along with the satisfaction of knowing it is possible, that all the work and effort and patience is worth it. Oh well. There are worse things in the world, right? Here are some photos of hunts we’ve done together over the years (most taken by Leslie McMichael). 7 below zero with a screaming wind-chill. Good times (and no birds). A great achievement! This young man can achieve anything he puts his mind to – and this proves it! Love the series of pics! Fantastic! Glad everything finally came together for the kid. Absolutely perfect. I feel like the wait was meant to be, and that both of you benefited. Thank you. This is another great story. Thanks for sharing. Here is a video you will not find repeated. Share this with your other hunting friends. This will show you what can happen when the hunter becomes the one being stocked. I wrote the following to a friend about this weekends hunting trip. I shot all of the geese taken on Wister today. It was only three snows, but I shot a 100% of the take. That is a first for me. I have shot above 50% of the total take many times. On top of that I did not miss a shot and all of the birds were taken right above the blind. They were looking for where the call was coming from. It is nice when it works like it is suppose to work. Just wish there were more birds at Wister. I have never seen so few birds before at this time of the year. Good luck on the next trip. When you teach a young person to hunt you change their life forever. When he is 70 he will still remember that first bird. Well done to both of you. Congratulations to “the kid” and the McMichaels on a great continuing story. Man that’s a great story… priceless for you both!! Hes got the insatiable Fever now!! Thanks for your sharing as I am in-between dogs this season and my patience aren’t the best as my own son is ready for his first ” contact” with the mighty CHUKAR. We’re out a bit walking our guns for practice in the lowlands but not to productive for tablefare. All in all the experience of learning to carry a gun is important and he says he’s having fun so that’s the goal…. Congratulations to both young hunter and wise mentor! The continued quest shows said duo well matched. I have been a witness to death marches which ended ambitions of future bird hunters.